You cannot make a deal for points, points will be given chopped out at the Tournament Directors discretion, and points will be taken away if a player makes a deal for points. For example, “Ill give you $50 more for 1st place points and you can take home the extra money”, would result in both players forfeiting the points. Any player who plays in a NLH cash game will earn a raffle ticket for any FULL HOUSE or better hand. Every Saturday Players with raffle tickets can enter into the Saturday Drawing. Every Saturday in June, July and August (until the main event) one lucky player will win a $580 CSOP Main Event Seat. Raffle Ticket Rules: You must table your hand, you must win the hand & the pot must be over $20 in order to qualify for a raffle ticket. The raffle tickets are not transferable and not redeemable for cash. Drawing Rules: All tickets must be turned in by 6pm at the bank. The drawing will be held every Saturday during the CSOP at 10pm. One winner will be pulled from the drum, and must be present in order to win the seat. If the player is not in the room during the drawing (10min window) a new winner will be drawn. Only the tickets submitted on that day will be eligible to win. You can win multiple seats, but wining tickets cannot be bought or sold only the winning player can use the FREE seat. 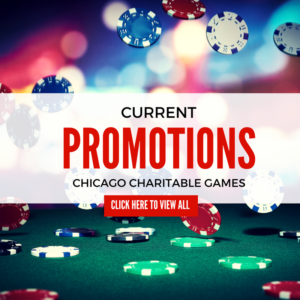 Every Monday Night at the Rocking Horse in Oak Lawn players can play in a free poker league. If you are a VIP member you can earn points, the points winner will win a FREE $580 seat. Please go to www.ClubCCG.com for more information on how you can win can be crowned the season points winner. 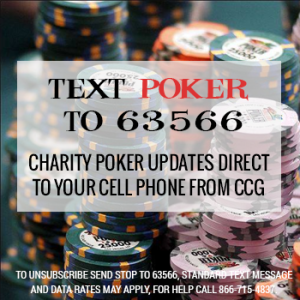 Any questions on the points list, if you have won a seat, or general questions about the Chicago Series of Poker (CSOP) please feel free to contact Ken at ken@chicagocharitablegames.com or on my cell phone at 630-901-9797 or use the contact us page at the top of the website to send any questions.